^ 1.0 1.1 Who are Nigeria's Boko Haram Islamist group?. BBC News. 2016-11-24. ^ How Big Is Boko Haram?. 2015-02-02 [2015-02-02]. ^ Are Boko Haram Worse Than ISIS?. Conflict News. （原始内容存档于2015-03-17）. ^ 存档副本 (PDF). [2015-02-23]. （原始内容 (PDF)存档于2015-02-16）. ^ Security Council Al-Qaida Sanctions Committee. ^ Robin Simcox. Boko Haram and defining the 'al-Qaeda network'. aljazeera.com. 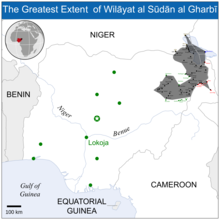 ^ Boko Haram too extreme for 'al Qaeda in West Africa' brand. Reuters. ^ Al-Qaeda map: Isis, Boko Haram and other affiliates' strongholds across Africa and Asia. Telegraph.co.uk. 2014-06-12. ^ Boko Haram voices support for ISIS' Baghdadi. Al Arabiya. 2014-07-13 [2015-02-04]. ^ 10.0 10.1 10.2 Bureau of Counterterrorism. Country Reports on Terrorism 2013. US Department of State. [2014-08-07]. ^ 11.0 11.1 11.2 存档副本. [2015-01-10]. （原始内容存档于2015-01-18）. ^ 12.0 12.1 12.2 Our Reporter. Jonathan tasks Defence, Foreign Ministers of Nigeria, Chad, Cameroon, Niger, Benin on Boko Haram’s defeat. sunnewsonline.com. ^ 13.0 13.1 13.2 Martin Williams. African leaders pledge 'total war' on Boko Haram after Nigeria kidnap. the Guardian. ^ Chadian Forces Deploy Against Boko Haram. VOA. 2015-01-16 [2015-01-16]. ^ Nigeria policemen in court trial for Boko Haram killing. BBC News. 2011-07-13. ^ 17.0 17.1 17.2 17.3 Dozens killed in Nigeria clashes. AlJazeera. 2011-12-24 [2011-12-24]. ^ Farouk Chothia. Who are Nigeria's Boko Haram Islamists?. BBC News. 2014-05-20. ^ Oren, Dorell. Terrorists kidnap more than 200 Nigerian girls. 2014-04-23. ^ 24.0 24.1 Chothia, Farouk. Who are Nigeria's Boko Haram Islamists?. BBC News. 2011-08-26 [2011-09-01]. ^ Mapping out the Global Muslim Population 互联网档案馆的存檔，存档日期2009-10-10. ^ 劫持300女生 博科聖地將受制裁. 聯合新聞網. 2014-05-23. ^ 宣称效忠IS 博科圣地改名为“伊斯兰国西非省”. 中国日报网. 2015年4月27日. ^ Dozens killed in Nigeria clashes. London, England: BBC. 2009-07-26 [2010-01-02]. ^ Nigeria's 'Taliban' enigma. BBC News. 2009-07-28 [2009-07-28]. ^ Boko Haram strikes again in Borno, kills 4 互联网档案馆的存檔，存档日期2012-03-14. ^ Sani, Sani Muh'd. "Attack On Bauchi Prison - Boko Haram Frees 721 Inmates." allAfrica.com. 8 September 2010. Retrieved on 31 May 2011. ^ Nigerian police: Gubernatorial candidate assassinated. CNN. 2011-01-28. ^ Six killed in Nigerian political massacre. The Daily Telegraph (London). 2011-01-28. ^ More bombs follow Nigeria inauguration UPI, May 30, 2011. ^ Brock, Joe. Nigerian Islamist sect claims bomb attack: paper. Reuters. 2011-06-17 [2011-06-17]. ^ 20 killed in blast, shootings in northern Nigeria. 2011-07-04. ^ BBC. Abuja attack: Car bomb hits Nigeria UN building. BBC News. 26 August 2011 [26 August 2011]. ^ Nigerian lawmaker shot dead, police suspect sect. Reuters (Thomson Reuters). 2011-10-17 [2011-10-17]. ^ Nigerian sect says killed journalist for spying. Reuters. 2011-10-25 [2011-10-25]. ^ Nigeria Boko Haram attack 'kills 63' in Damaturu. BBC News. 2011-11-05 [2011-11-05]. ^ Nigeria: Boko Haram Suicide Attack Killed Dozens. The Huffington Post. 2011-11-05 [2011-12-25]. ^ Nigeria churches hit by blasts during Christmas prayers. BBC News. 25 December 2011 [25 December 2011]. ^ 56.0 56.1 Mshelizza, Ibrahim. Christians flee attacks in northeast Nigeria. Maiduguri: Reuters. 2012-01-17 [2012-01-22]. ^ 57.0 57.1 Mshelizza, Ibrahim. Christians flee attacks in northeast Nigeria. Reuters. 7 January 2012 [7 January 2012]. （原始内容存档于2012年1月13日）. ^ 尼日利亚北部连环爆炸 医院堆积至少80具尸体. 中国新闻网. 2012年1月21日. ^ 尼日利亚极端穆斯林组织袭击官方机构 百余人死亡. 羊城晚报. 2012年1月23日. ^ Sky News (编). Nigeria: More Bombs Found As Death Toll Rises. Sky News. 2012-01-23 [2012-01-23]. ^ Nigeria jailbreak: Boko Haram claims Kogi prison attack. BBC. 16 February 2012. ^ 3名朝鮮醫生在尼日利亞遇害身亡 疑為極端組織所為. 國際在綫. 2013-02-10. ^ Damien McElroy. Extremist attack in Nigeria kills 42 at boarding school. 《每日電訊報》. 2013年7月6日 [2013年7月8日] （英语）. ^ Nigeria's Boko Haram 'in village massacre'. BBC News. 2014-02-16 （英语）. ^ 尼日利亞公交車站爆炸 70多人喪生. BBC中文網. 2014-04-14 [2014-04-15] （繁体中文）. ^ Nigerian villagers fight off attacks by Boko Haram. cnn.com. 2014-05-16. ^ Alleged Boko Haram Gunmen Kill 45 Nigerian Soldiers, Officers. VOA. 2014-05-27. ^ Nigeria bomb blast in north-east kills at least 14 people. the guardian. 2014-06-02. ^ Over 220 confirmed dead after Boko Haram attack in Damaturu. DailyPost Nigeria. 2014-12-03. ^ 博科聖地又在奈國綁架185人. 新浪. 2014-12-18. （原始内容存档于2014-12-22）. ^ Boko Haram slaughter up to 2,000 people. Dailymail. 2015-01-09. ^ '109 Boko Haram fighters dead' after first attack on Niger. AFP. 2015-02-06 [2015-02-07]. ^ John Hall,"Boko Haram's headquarters DESTROYED: Nigerian military mounts massive operation reclaiming terrorist group's 'capital city'", DailyMail, 09:02GMT, 2015-03-28. ^ Nigerian President Plans to Negotiate for Release of 110 Abducted Dapchi Girls. VOA. 2018-03-12.